Why eat regular pasta when you could enjoy a deliciously fresh alternative with a fraction of the calories and carbs? Here's all the info on making, cooking, and eating zucchini noodles. I started using zucchini as a pasta swap because it converts perfectly into noodles and saves so many calories and carbs. One cup of regular cooked pasta has about 200 calories and 40 grams of carbs— That's a lot for such a small portion. Compare those stats to zucchini noodles: You can have two cups (yes, twice as many!) for around 70 calories and 14 grams of carbs. Another veggie that makes a great pasta swap? Spaghetti squash! Best part? You can make it in a slow cooker. The best way to make noodles out of zucchini—or z’paghetti, as I like to call it—is with a spiral vegetable slicer. My personal favorite is the Veggetti, which you can get for $10 or so over on Amazon and in stores like Bed Bath & Beyond. If you don’t have a spiral veggie slicer, you can use a regular vegetable peeler, like the kind you’d use to peel carrots or potatoes, but I highly recommend investing in the tool. It’s simple to use, and it’ll give you the best results. Ready to make some z’paghetti? Good! 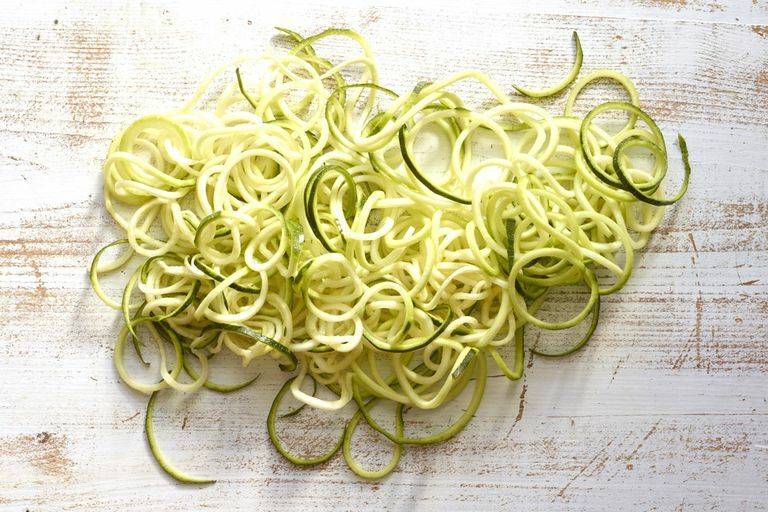 All you need is zucchini and your spiralizer. Feed the zucchini into the handy gadget (there’ll be specific instructions with the tool), rotate, and watch as spaghetti-like noodles emerge! If you’re using a standard veggie peeler, peel the zucchini into super-thin strips, rotating the zucchini after each strip. Whichever method you use, give your noodles a rough chop afterward; they tend to be pretty long! You can actually enjoy these raw in chilled salads and noodle dishes, but here's how to cook them for hot dishes. Just spray a skillet with nonstick spray; then cook and stir the zucchini noodles until slightly softened and hot, about 3 minutes. If there’s excess liquid, drain it. That’s it! Z’paghetti with Marinara: Just add your favorite marinara sauce to the cooked noodles: Look for one that's low in fat with 60 calories or less per 1/2-cup serving. Then sprinkle with grated Parmesan. This is great with lean meatballs! Lemon-Butter Z’paghetti: Cook up the noodles with a squirt of lemon juice, some chopped garlic, and a little salt. Then toss with some light butter, and sprinkle with chopped basil. So good! I love it with shrimp. Pesto Z’paghetti: Pesto can be high in calories, but I have a creamy version that's completely guilt-free. In a small blender or food processor, combine 1/2 cup light ricotta cheese, 1 tbsp. grated Parm, 1/4 oz. (about 2 tbsp.) pine nuts, 1/4 cup chopped basil, 1 1/2 tsp. chopped garlic, and 1/4 tsp. each salt and pepper. Add 3 tablespoons water, and blend until uniform. That'll give you enough pesto sauce for two servings of zucchini noodles... Try it! Still craving pasta? Learn more low-carb ways to satisfy a pasta craving. Yum!